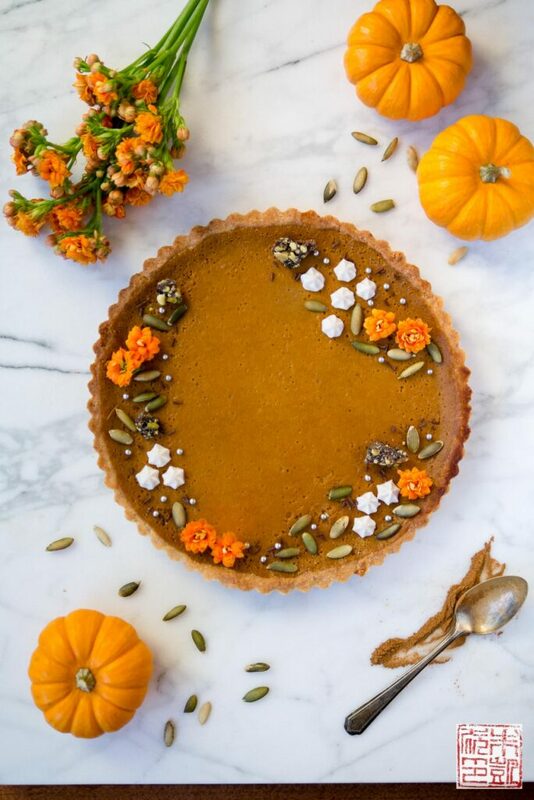 This autumn pumpkin tart is a sleek take on pumpkin pie and perfect for Halloween, Thanksgiving, and your holiday table. So after I mentioned in my last post that I wasn’t a big fan of pumpkin in general, yes I went and made something with pumpkin. Isabelle is very into Halloween this year, so with all the trick-or-treating plans and pumpkin hunting at the pumpkin patch, I figured I should get in the mood baking-wise as well. 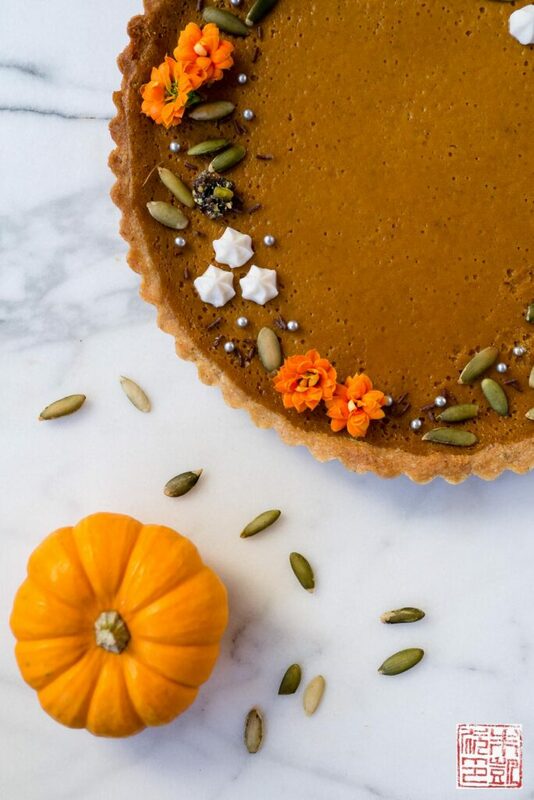 It ended up being a fun exercise in doing pumpkin pie my way – as a tart, of course! 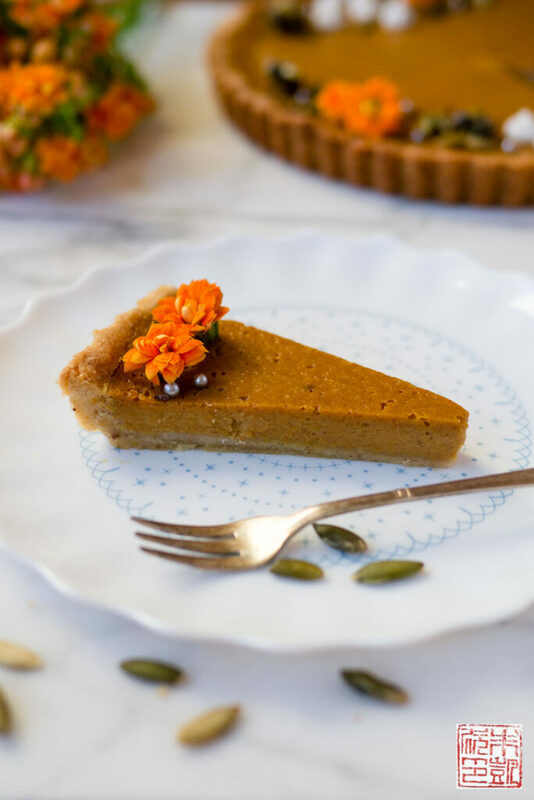 This pumpkin tart is adapted from one of my go-to cookbooks, Dorie Greenspan’s Baking From My Home to Yours. 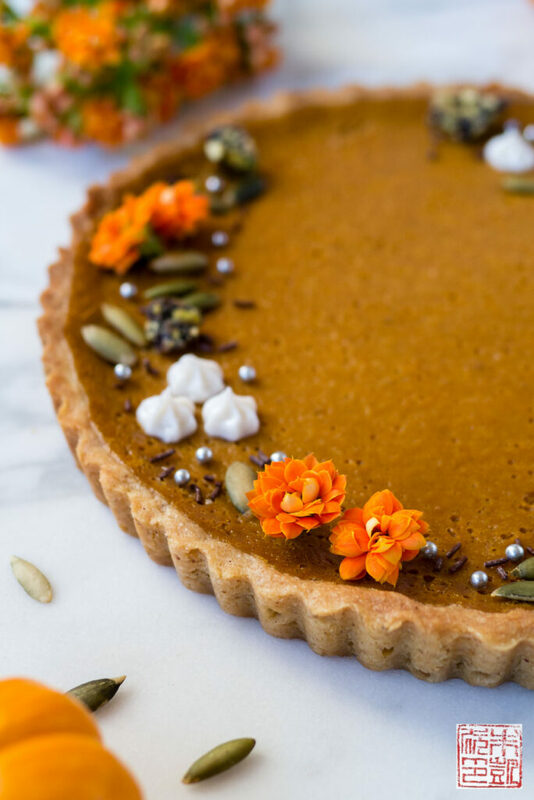 It’s got everything you’d want in your pumpkin pie filling, from brown sugar to rum to a generous sprinkling of spices, and the sour cream gives it that extra bit of smoothness and richness. The crust is really my favorite part: a classic buttery-tender pâte sablée enriched with hazelnuts to make it extra nutty and fragrant. No rolling required for this dough, so it’s even less stressful than making a pie; you simply press the dough in the tin, chill, and bake for a crust ready to be filled. I like the richer tart crusts for fall and winter, but if you don’t have hazelnuts or don’t want to include them, you can substitute the half cup of all-purpose flour back into the recipe. 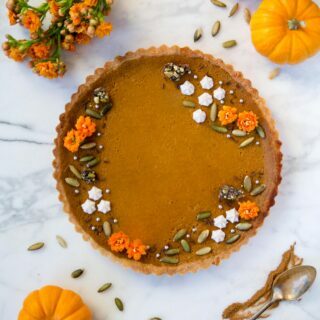 As a tart fan, I like the ratio of filling to tart crust, but if you are a die-hard pumpkin pie lover this filling will also work in a pie crust. The amount of filling made actually is a bit more than is needed for the tart, so it should work well for a pie crust. Or, save the filling and make a mini tartlet if you also have some tart dough left over! There’s apparently a bit of debate over whether pumpkin pie is best at room temperature or chilled. I will confess I haven’t had enough pumpkin pie to make a definitive decision, but for this tart at least, I was very taken with it when it had cooled down to room temperature, with perhaps just a smidge of warmth left. The texture of the filling is so silky and mousse-like, and you can taste all the brown sugar and spices coming through. Not shown but perhaps not-optional: a healthy dollop of whipped cream on the side. Between the toasting nuts and baking spices, it finally smelled like autumn in our house this weekend! Combine hazelnuts and confectioners' sugar in a food processor. Process until the nuts are finely ground and combined with the sugar. Add in the flour and salt and process to fully combine. Add in butter and process in quick pulses until the mixture resembles coarse crumbs - it should not be fully combined into a ball. Add in the egg yolk and process in quick pulses just until the dough starts to form larger clumps. Again don't let it fully combine into a solid ball of dough. If the dough holds together when you press some small pieces together, it's done. Butter a 9" round tart tin with removable bottom. Gently press the dough into the bottom and sides of the tart tin. You may have some dough left over. Freeze the tart shell for 30 minutes before baking. Butter the shiny side of a piece of foil and press it down over the crust. Place tart pan on a baking sheet and bake for 25 minutes, until crust is dry and lightly browned. If the crust has puffed up, press it down with a spoon or dough tamper. Let crust cool on cooling rack while you assemble the filling. Line a baking sheet with a silicone baking mat or piece of parchment paper and place the tart shell on it. Combine all the filling ingredients in a food processor and process for 2 minutes, scraping down the sides occasionally, until combined and very smooth. Rap the processor bowl against a work surface to get rid of any bubbles, and pour filling into the tart shell. You will have some filling left over - save these for mini tarts! Bake for 10 minutes, then reduce temperature to 300 degrees F and bake for 20 to 25 minutes more, until the center is set - it should jiggle only slightly if you tap the pan. Remove from oven and let cool on rack to room temperature.